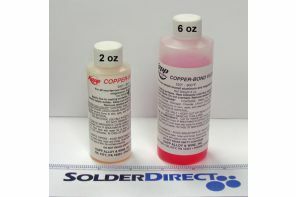 Kapp Copperbond™ Flux is designed for the high temperature soldering of all common metals except Aluminum. It is an activated liquid flux containing a mixture of inorganic salts in water, with approximately 50% active ingredients. Effective fluxing action occurs at 550-800°F (288-427°C). Kapp CopperBond™ Flux will char at temperatures above 800°F (427°C). The following chart represents the physical properties of Kapp CopperBond™ Flux. Many factors, such as materials, temperature, and method of application determine the most effective flux. Call Kapp for engineering assistance to discuss your specific needs. We recommend testing appropriate fluxes in your specific application to ensure suitability.